If you were expecting Samsung’s Galaxy Note 9 to be the exciting, innovative step forward the smartphone space desperately needs right now, the South Korean tech giant’s latest handset is not that device. It seems that Samsung’s always interesting, but often not well executed era of experimentation with the Note brand that started back in 2011, is all but over — at least as far as the Note 9 is concerned. I’ve been fond of the Note line over the years because it typically introduces some sort of interesting functionality that later makes its way to the company’s other phones. Examples include ‘Screen-off Memo,’ the questionably useful ‘Iris Scanning,’ and split-screen multitasking, which is now a core Android feature. Samsung had a lot to prove with the Note 8 following the Note 7 disaster. 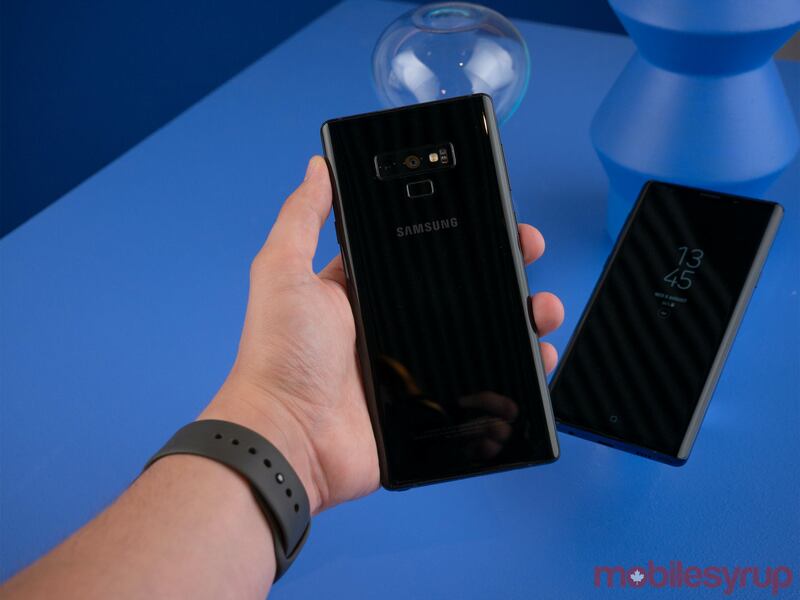 Unsurprisingly, the company played it safe with last year’s Note smartphone, and that trend continues with the Note 9. 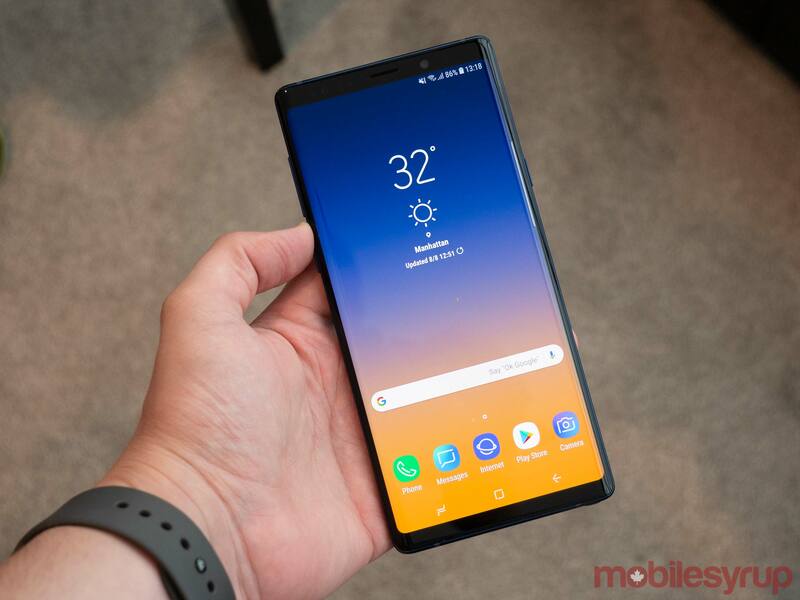 That said, if you’re able to swallow the Note 9’s admittedly expensive $1299 CAD starting price tag, it remains one of the best — if not the best — Android handsets out there. There’s little to fault the Note 9 for, but it’s far from an exciting device and doesn’t feel like a significant step forward for Samsung. The smartphone is the embodiment of the word iterative, just like last year’s iPhone 8 was for Apple. As a result, if you’re already a Note 8 owner, or a S8 or S9 user, this year’s model is worth skipping. 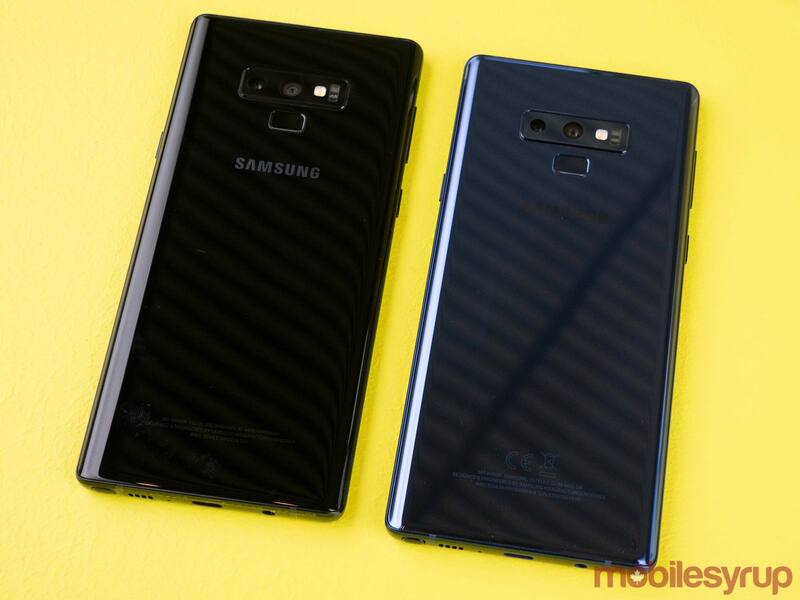 Generally, the Note 9 looks identical to its predecessor, though the phone’s Super AMOLED Quad HD 18:5:9 display measures in at 6.4-inches this time around instead of the 6.3-inch featured with the Note 8. The average person likely won’t notice the screen size difference, though. During my brief hands-on time with the device, I placed the Note 8 beside the Note 9 and the overall visual difference between both smartphones was negligible. The big change this year is that Samsung has moved the Note’s rear-facing fingerprint sensor to beneath the phone’s dual camera array, rather than beside the camera like with last year’s Note 8. This makes accessing the fingerprint sensor much easier and is great news for anyone who was not fond of the Note 8’s various ‘Intelligent Scanning’ facial recognition features, which once again includes Iris Scanning and the less secure facial recognition option. Like it or not, the curved sides that have now become a staple of the design featured in Samsung’s high-end phones, are back. While I’d hoped that the company would opt to change things up, that hasn’t happened with the Note 9. 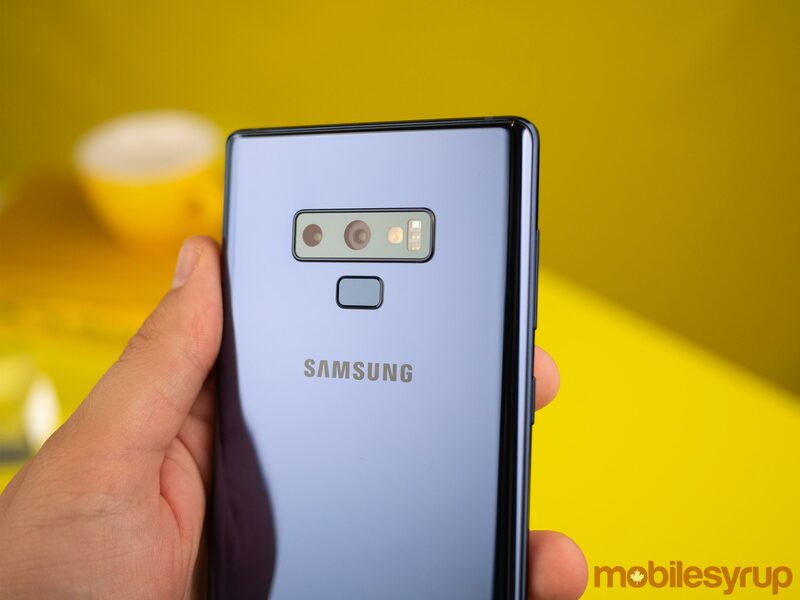 In terms of colour, Samsung will release the Note 9 three colours: ‘Midnight Black,’ ‘Ocean Blue,’ and ‘Lavender Purple.’ However, only the first two variants of the smartphone are making their way to Canada. 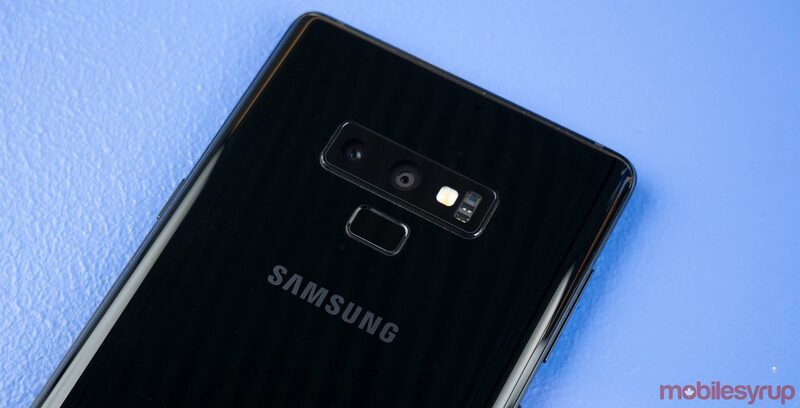 The Black version of the smartphone is also set to be sold exclusively through Samsung.com and Samsung Experience stores, according to the company. The Black version of the smartphone features a matching black S Pen, while the Ocean Blue iteration includes a contrasting bright yellow stylus. While some might not be fond of the yellow stylus, I found the colour gave the phone a unique look. The Note 9 also continues to feature a headphone jack, too. The dreaded notch fever so many Android manufacturers have been infected with over the last few months, has avoided making its way into the Note 9’s design. 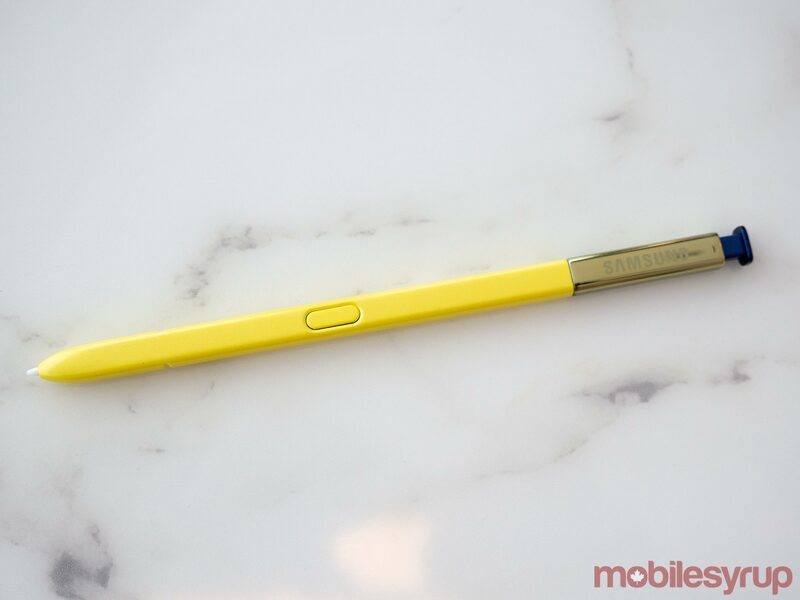 Since Samsung doesn’t have a flashy feature to show of this year beyond the new, Bluetooth-enabled S Pen, much of the company’s focus with the Note 9’s marketing will likely hone in on the handset’s technical specifications. This makes sense given this is the area where, depending on how much you care about owning the latest hardware, the Note 9 could be worth your time. So let’s get into it: the Note 9 features a 4,000mAh battery, which is a 700mAh improvement over the Note 8’s 3,300mAh power source. The battery increase surpasses even the ill-fated Note 7’s 3,500mAh battery. While this could be considered a cause for concern given Samsung’s track record, the company claims its eight-point, third-party reviewed battery inspection process is still in place when it comes to the Note 9. The smartphone’s storage also starts at 128GB this year, bumping out the expected 64GB option, with a more expensive 512GB version coming to Canada, as well. In an interesting move, with the 128GB version the Note 9 includes 6GB of RAM — just like last year’s Note 8 — but with the 512GB option, the smartphone features a sizeable 8GB of RAM. 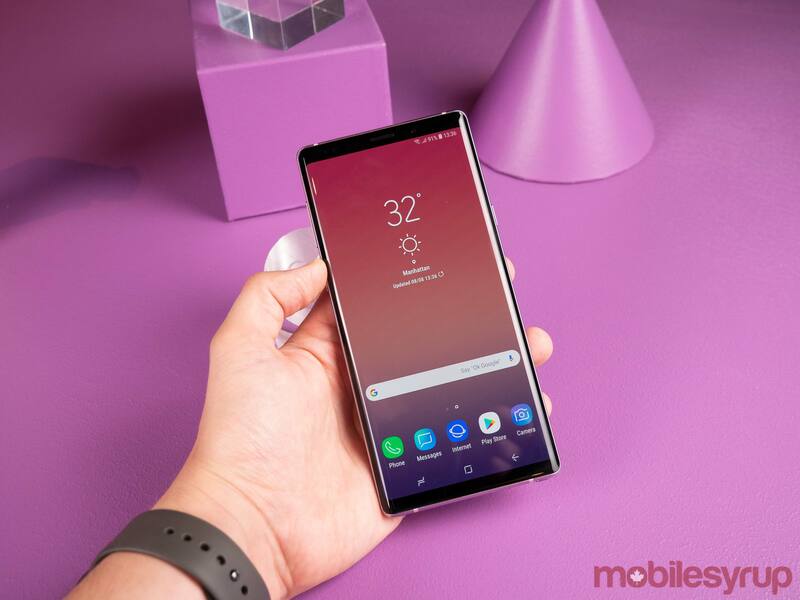 Other hardware changes include the jump to Qualcomm’s Snapdragon 845 processor, which should give the Note 9 — especially the 8GB variant — a significant performance boost when it comes to high-end applications and multitasking. Given Samsung’s push to make its DeX desktop dock a legitimate and useful alternative to desktop-class PCs, the more power packed into the Note 9, the better. Speaking of DeX, Samsung is also launching a new DeX dongle accessory that allows the Note 9 to enter desktop mode. 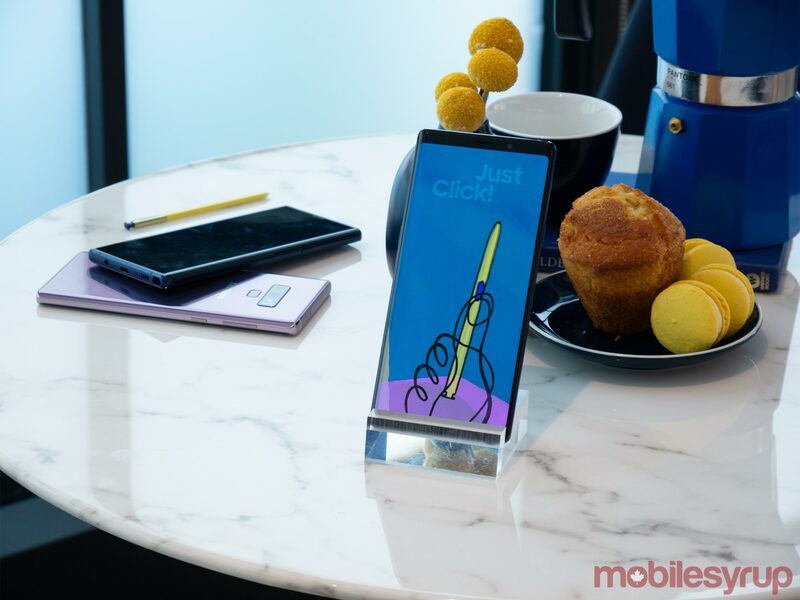 With this new dongle-like accessory, the Note 9’s display acts as the trackpad, coupled with an on-screen keyboard — this functionality is similar to the Huawei P20’s desktop mode. While more convenient, this setup doesn’t seem to allow a Bluetooth keyboard and mouse to be plugged in like the previous DeX dock and DeX pad. During my briefing on the Note 9, Samsung showed off how this accessory allows you to continue interacting with the smartphone, with DeX still being enabled on an external display. Further, the phone’s speakers are once again tuned by AKG. While I only spent a brief amount of time listening to music on the phone, the sound was powerful and impressive. 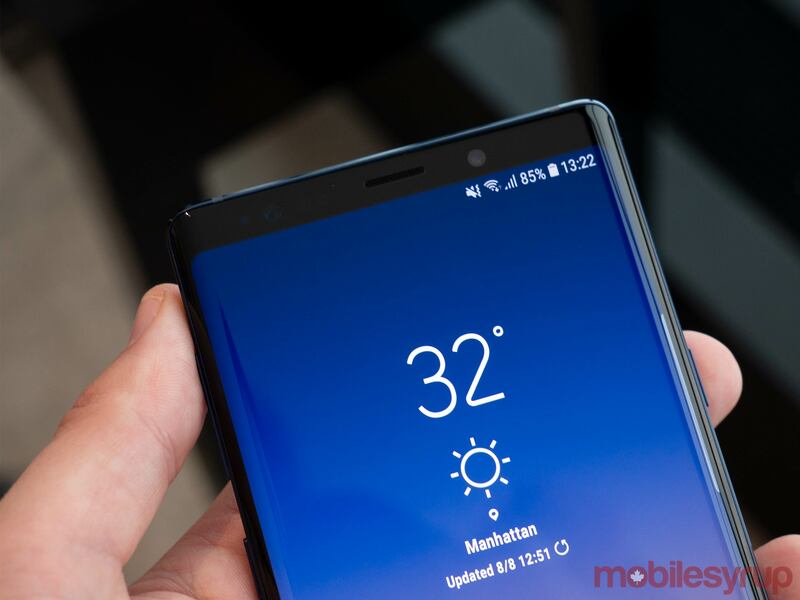 Samsung also says that the Note 9 should run cooler thanks to an improved water carbon cooling system. Of course this is the type of claim that needs to be put through its paces once I actually get my hands on the phone for a longer period of time. The same camera featured in the S9+, including the smartphone’s impressive variable aperture, is back once again in the Note 9. This means that the Note 9’s rear 12-megapixel 26mm shooter is capable of switching between f/1.5 (which is even wider than the LG V30’s f/1.6 aperture) and f/2.4. The other 12-megapixel 52mm rear lens allows for 2x optical zoom and features an aperture of f/2.4. Both rear lenses also include optical image stabilization (OIS), just like the S9+. 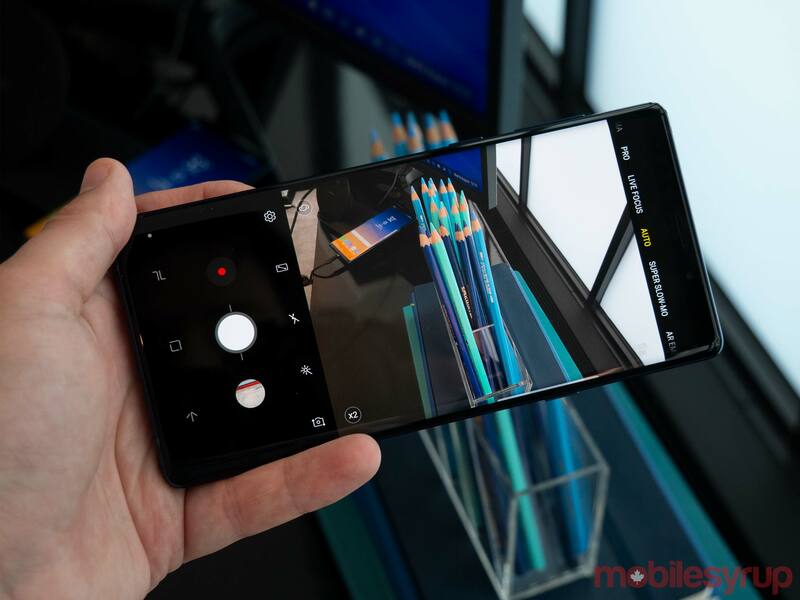 What’s different this year is Samsung has added new automatic shooting features to the Note 9. This system, which the firm is calling ‘Scene Optimized,’ is capable of analyzing 20 different photography situations and automatically picking “the best possible settings.” This feature seems very similar to the photography optimization included in LG’s G7 and Huawei’s P20 Pro. I briefly tested out the feature and while in some cases it did seem to result in what some might consider a higher quality photo, the image looked even more digitally processed than it did before — which is already a common complaint with Samsung’s cameras. There’s also a new ‘Flaw Detection System’ that notifies users when an issue has been detected in a photo. While I didn’t test this feature out, the example Samsung gave during my pre-brief was someone blinking during a shot. The selfie camera also once again measures in at 8-megapixels with an f/1.7 aperture, just like it did with the S9 and S9+. Now we’ve come to the S Pen, which almost amusingly Samsung is positioning as this year’s significant new feature. All jokes aside, the ability to use the S Pen as a remote shutter was more useful than I expected. With a simple click of the new Bluetooth-enabled stylus, I was able to snap a few quick shots of myself. I could see this being useful for family shots or other situations when someone isn’t around to hold the camera for you — of course, you’d also need a tripod. The new Bluetooth S Pen features a range of 30 feet, with the battery lasting up to “200 clicks” or 30 minutes, according to Samsung. The Pen also features technology Samsung is calling a ‘Supercapacitor,’ allowing the stylus to act as a low-energy Bluetooth controller. Samsung says it also plans to open up the S Pen’s APK to third-party developers. Interestingly, though the Note 9 features Bixby, Samsung’s on-phone voice-activated assistant, there was no mention of the feature during my briefing on the smartphone. Perhaps Samsung has finally accepted that it’s little dog, that also wears shoes, and is also a butler, just can’t compete with Google Assistant, Alexa and, to a lesser extent, Siri. Samsung’s often-rumoured in-display fingerprint sensor also isn’t making its first appearance with the Note 9 either. This means that it’s still possible the inevitable S10 will feature the mythical in-display scanner present in the Vivo X21. The rumours related to Fortnite are true. The popular third-person battle royale game will launch on Samsung smartphones first. Although it was previously rumoured that the game would launch exclusively on the Note 9, Samsung says the Fortnite will be available on all Galaxy S7 and up devices. It’s difficult to find fault with the Note 9 beyond its expensive price tag. The phone features everything that was great about the S9+, including the smartphone’s impressive camera, as well as what those more technically inclined would likely consider a moderate spec bump. Still, I can’t help but long for the days when the Note brand was more than just a Galaxy S series device with a stylus. The wacky experiments Samsung has pulled with the brand over the years, including the monumental design leap forward the Note 7 was for Android devices, as well as the South Korean company’s design prowess, are firmly planted as some of the most exciting moments in handsets over the last few years. Whether or not the Note 9 is for you will depends on two factors. For one, will you use the smartphone’s stylus? If the answer is no, you’re better off picking up a Galaxy S9, or waiting for the S10. 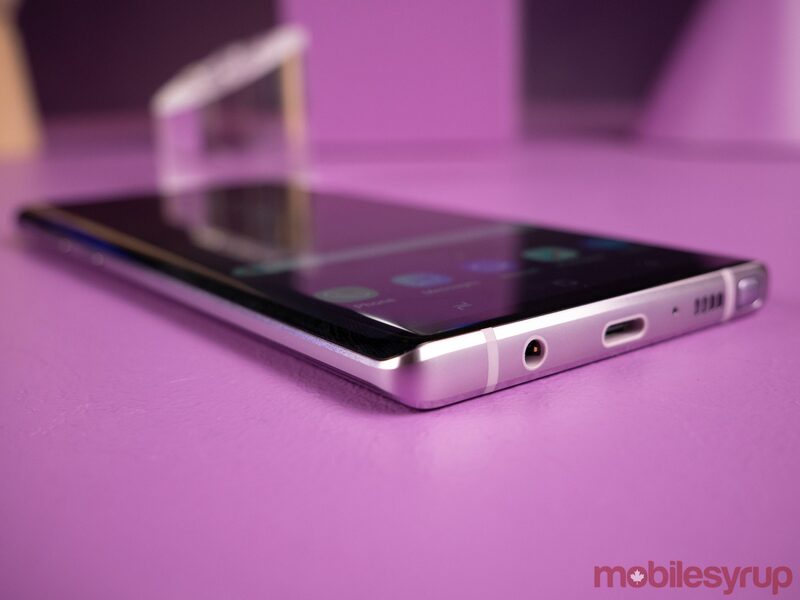 Are you a fan of the Note line, but already own the Note 8? If this is you, then I’d argue that the Note 9 isn’t enough of a leap forward, unless you’re really into technical specs. 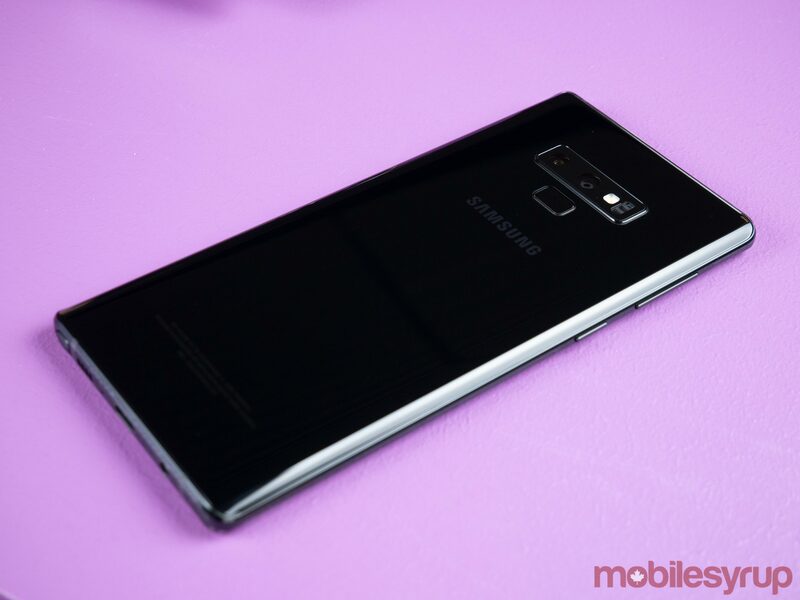 The 128GB Note 9 will cost $1299 CAD, while the 512GB model is priced at $1,629. Pre-orders are available in Canada starting August 9th, with the phone being available in store and online starting on August 24th, 2018. Anyone who pre-orders the Note 9 between August 9th and August 23rd will get a free pair of Samsung’s Gear IconX headphones, which retail for $299.99. 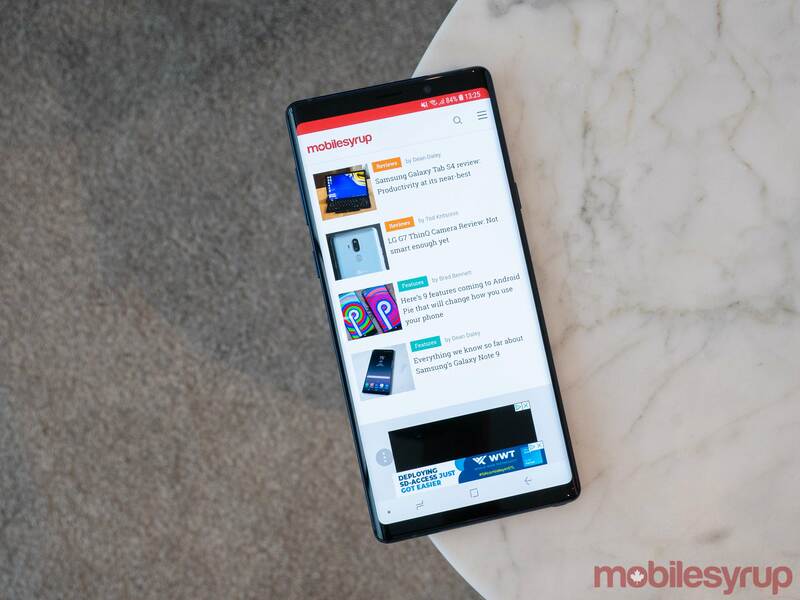 Canadian carriers Bell, Rogers, Telus, Freedom Mobile and Videotron will also sell the Galaxy Note 9.